Atorvastatin (Lipitor) is a member of the drug class known as statins. It is used for lowering cholesterol. 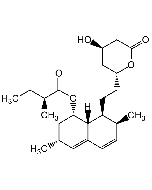 Atorvastatin is a competitive inhibitor of hydroxymethylglutaryl-coenzyme A (HMG-CoA) reductase, the rate-determining enzyme in cholesterol biosynthesis via the mevalonate pathway. 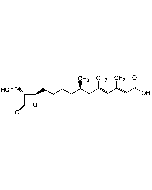 HMG-CoA reductase catalyzes the conversion of HMG-CoA to mevalonate. Atorvastatin acts primarily in the liver. Decreased hepatic cholesterol levels increases hepatic uptake of cholesterol and reduces plasma cholesterol levels. IC(50) values are in the low nanomolar range with cytotoxicity values being largely in the low micromolar range.